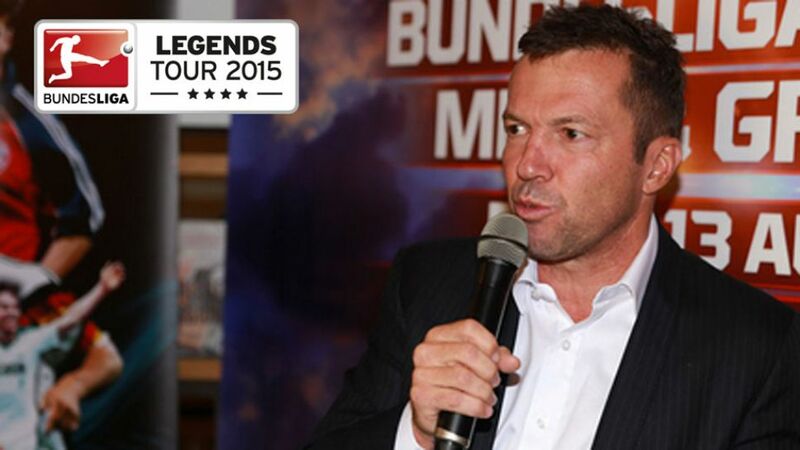 Cologne - After spending 48 hours in Kuala Lumpur, retired Bundesliga great Lothar Matthäus has already arrived in Singapore for the next leg of his part in the Bundesliga Legends Tour 2015. Before heading across the Causeway, however, the 54-year-old, who got his hands on seven Bundesliga titles during his time at FC Bayern München and won the 1980 UEFA European Championships and 1990 FIFA World Cup with Germany, spent his time in the Garden City of Lights singing the many virtues of Germany's top flight and talking up the work ethic of the Bundesliga's numerous Asian stars. "You have to work hard," Matthäus explained when asked by journalists at Kuala Lumpur’s Hilton Hotel about the key to achieving international success. "Academies are the way forward. Develop young players. 20 years old is too late. You have to start early. The Germans did it very well and in the last 20 years we have qualified for the World Cup semi-finals four times and last year we won the title. We do not only follow our style. We can't say we are the best. We like to learn from other countries too." Matthäus also discussed the thriving relationship between the Bundesliga and Asia as a whole. "We have 12 players from Japan, seven from South Korea," he said. "When you see the number, it’s pretty clear that Asians are making their presence felt on our game. First, it is good for Asian football because the players can learn from the league and take it back to the national team. We profit from them too. They have the mentality of a German. They like to learn, they like to fight and they are team players." With Matthäus busy opening south-east Asian eyes to the wonders of the Bundesliga, fellow Bundesliga Legends Tour 2015 representative, retired goalkeeper Jens Lehmann, continues to do his bit on the other side of the world. Following a couple of days in New York (11-12 August) and Mexico City (13-14 August), the two-time UEFA Club Goalkeeper of the Year, who played for Bundesliga clubs FC Schalke 04, Borussia Dortmund and VfB Stuttgart, will wrap up the tour in Rio De Janeiro, the scene of Germany’s aforementioned 2014 FIFA World Cup triumph.